SHOULD THE RUKUN NEGARA BE MADE THE PREAMBLE TO THE CONSTITUTION? A preamble to the Constitution is a brief introductory statement about the fundamental purpose of the Constitution and the guiding principles. It states the general intention of the founders regarding the purpose of the Constitution and what they hope will be achieved by the Constitution. Being the intention and the desire of the founders, it is usually written at the time when a Constitution is drafted. The Federal Constitution (Malaysia) does not have a preamble. It begins with the substantive provisions of “Part 1, The States, Religion and Law of the Federation”. The Singapore Constitution also does not have a preamble. England does not even have a written Constitution. The preamble of the Constitution of Pakistan is too long to be reproduced in this article. In this article, I am relying on an article titled “The Preamble In Constitutional Interpretation” by Liav Orgad from The School of Law, The Interdisciplinary Center Herzliya. The article was presented at W. G. Hart Legal Workshop on “Comparative Aspects on Constitutions: Theory and Practice” at the Institute of Advanced Legal Studies in London and published by the International Journal of Constitutional Law. Citation: 8 Int’l J. Const. L. 714 2010. This is because, I found that he had made a thorough study and his findings and arguments are convincing. However, I do not blindly accept every opinion of his. It is subject to my own views and arguments, taking into account the situation in Malaysia. Let us look at what he said about the developments in India. • Judge Halim bin Abdul Hamid – Pakistan. Now, the Constitution has been in force for 60 years. To my knowledge, there has not been a judge, in his judgment when interpreting the Federal Constitution who said that his task was difficult because there was no preamble to refer to or exprressed an opinion that a preamble should be inserted. I myself, from the High Court to the Federal Court, had to decide cases that required interpretation of the Federal Constitution. It did occur to me that my job would be made easier if there was a preamble to our Constitution. Not only the judges, even lawyers, both from the Attorney General’s Chambers and the Bar Council, as far as I can remember, had never suggested that a preamble be provided in our Constitution. Throughout my career as a judge at all levels, not once did I ever hear complaints about the absence of preamble. “As a preamble, five Rukun Negara objectives will be considered as national goals that reflect the aspirations of our people. The five principles of the Rukun Negara will be accepted as guidelines that defines our approach to our national goals. Both the objectives and the principles of the Rukun Negara — if accepted as preamble to the Constitution — will have the status of law.” (My translation). “Four, given its legitimacy, its inclusiveness and its timelessness, the Rukun Negara should now be endowed with the force of law. Only then will the courts be able to bestow it with meaning and substance. Though some judges have over the decades alluded to the Rukun Negara in their judgements, it has no role in the adjudication process. Five, since perceptions of state and society have become more and more polarised in recent years, it would make sense to bring back to the centre a philosophy which has the capacity to draw people together. There is no reason why Malaysians of different backgrounds and persuasions should not rally around a set of objectives and principles like the Rukun Negara. Six, the elevation of the Rukun Negara has become imperative partly because of the sometimes subtle push by sections of the Muslim populace for laws and policies that reflect their own particularistic interpretation of Islam which does not always represent the essence of the faith and its practice. Because this tendency is getting stronger, we have to empower a philosophy which is all-embracing and yet resonates with Islamic values and aspirations. The Pancasila, the guiding principles of the Indonesian state which has many parallels to the Rukun Negara, and is deeply rooted in the psyche of the people has undoubtedly played an effective role in checking bigotry and dogmatism in the world’s largest Muslim nation. Reasons for the group’s suggestion that Rukun Negara be made the preamble. 1. Perceptions of state and society have become more and more polarised in recent years. 2. Because of the sometimes subtle push by sections of the Muslim populace for laws and policies reflect their own particularistic interpretation of Islam which does not always represent the essence of the faith and its practice. 3. There is the other trend associated with a segment of the non-Muslim citizenry that in the name of hidebound secularism seeks to deny religion any role at all in the public square. So, to overcome these situations, it is reasonable to put foward a philosophy that has the ability to unite the people. That philosophy is what is contained in the Rukun Negara which could be equated with the Pancasila in Indonesia, he argued. He goes on to say, by making the Rukun Negara the preamble to the Constitution, the five principles of the Rukun Negara will be accepted as guidelines that defiines our approach to our national goals. Both, the objectives and the principles of the Rukun Negara will have the status of law. After that the Courts will be able to give it meaning and substance. In short, to solve the three problems mentioned above, the Rukun Negara should be made part of the Constitution which would have the force of law to be applied by judges in the interpretation of the provisions of the Constitution. As the national philosophy, it occupies the top spot. Validity or reasonablness an interpretation will be measured by the values mentioned in the Rukun Negara. Do the problems arise because of the absence preamble? Regarding the reasons given Dr. Chandra Muzaffar, assuming that the three reasons given by him are correct, my question is: Do they arise because of the absence of preamble in the Constitution? Malaysia has existed and developed with the same Constitution for 60 years. Compared with most countries of the former British colonies that obtained independence at about the same time, Malaysia is peaceful, democratic, developing rapidly, absorbing Islamic values as much as it could while guaranteeing freedom of religion to the followers of other religions. That cannot be denied. Of course, if we want to find faults, there are. The question is whether the faults are due to the absence of preamble in the Constitution? I do not think so. Some countrries with Constitution that have preamble, are worse of. Now, let us look at the three reasons one by one. First, polarisation. Polarisation is rooted since the British rule. In the days of British rule, polarisation seems to be a “national philosophy”. There was almost no direct relationship between the races. I say that, on this issue, no matter how bad the situation is after independence, it is still better than the situation during the time of the British rule. Of course, in the 60 years of independence, there are ups and downs. That is related to the political situation in the country. I will not argue about the reasons that give rise to polarisation in this article. All I say is that polarisation is not caused by the absence of preamble in our Constitution. It is the same with the “Islamic extremist group” and “hidebound secular group”. Their existence is not due to the absence preamble. Even if there is a preamble, they would not care. In other words, the three reasons mentioned do not exist because there is no preamble to our Constitution. So, on this ground alone, the argument put forward to make Rukun Negara the preamble to the Federal Constitution falls. Nevertheless, let us continue. Would the making of the Rukun Negara the preamble to the Constitution solve those problems? To continue with the discussion, let us assume that the said problems are caused by the absence of preamble. The next question is: By making the Rukun Negara the preamble to the Constitution, would the problems be solved? My answer is “No”. Those general provisions at the beginning of the Constitution are not going to change their views. It is the same with the “Islamic extremist group” and “hidebound secular group”. The existence of the preamble is not going to make any difference to them. It should be noted that the discussions on the role of the preamble in the interpretation of a Constitution is usually about a preamble which has existed since the original Constitution was made. It is in such a situation that we hear the argument that we should refer to the preamble to find the true meaning, purpose or intention of the founders of the nation. Such an argument cannot be fowarded if the preamble is inserted 60 years later. On the other hand, when the preamble is inserted 60 years later, lawyers will argue that there must be a reason why Parliament did so. Parliament does not do something in vain. Thus, the Court must seek the intention of the Parliament and give affect to it in interpreting a provision of the Constitution. The provisions of the Constitution (which had existed 60 years earlier) should be construed in accordance with the intention of Parliament (60 years later). As a result, there is the possibility of an interpretation that was made and remained binding for several decades will be changed later, causing the law to be uncertain. I have reproduced the review done by Liav Orgad about the trend of the courts in the world, including India, which increasingly relied on the preamble to create rights that are not provided for by the Constitution. To me this is a trend that may violate the doctrine of separation of powers and give judges the power of Parliament. NGOs would strongly object when the Executive interferes with the judiciary, although the court will annul the action, using processes that are available to it. But, now it seems as if we want the Court to assume the power of Parliament to make laws, to “amend” the Constitution in the name of “interpretation”. Looking at the judgment of some young judges in recent years, there appears to be a tendency to adopt the liberal social philosophy of Western countries and to follow the judgments of the courts in those countries without analyzing in detail the provisions of the Constitution and the law of those countries and ignoring the provisions of the our Constitution and law. They also refer to and adopt the provisions of the Universal Declaration of Human Rights (UDHR) without giving proper attention to the provisions of our Constitution. I refer to the case of Muhamad Juzaili Bin Mohd Khamis v State Government of Negeri Sembilan etc. MLJU 1063, as an example. We must remember that, unlike the Constitution of the United States and India, our Constitution clearly provides that “Islam is the religion of the Federation”. (The preamble of the Constitution of India provides that India is a “secular” state.) Unlike the Constitution of those countries, the Ninth Schedule of our Constitution provides clearly that the State Legislative Assembly shall have power to make laws to establish the Sharia courts and to create offences and provide punishments regarding “precepts of Islam” applicable only to persons professing the religion of Islam. So, whether the law made by the State Legislative Assembly is valid or not depends on whether the offence created is about the “precepts of Islam” or not, not whether it conflicts with the provisions on freedom of religion, equality and others. Unfortunately that was what was done by the judges, citing the Universal Declaration of Human Rights (UDHR) and the judgments of the court in other countries without analszing the provisions of our Constitution in depth. I am concerned that when Rukun Negara is made a preamble which has the force of law and judges are required to apply it in interpreting the Constitution, there might be judgments which are in conflict or inconsistent with the original intention of the existing specific provisions. Let us see how this could happen in relation to the objectives of Rukun Negara. I will only give three examples. Let us assume that the Rukun Negara is made the preamble to the Constitution which has the force of law. It, being a provision of the Constitution, is not just of an ordinary law but the supreme law of the Federation. Then, an argument is put foward that the intake of only Bumiputra students into UiTM is discriminatory because it prevents the achievement of unity contrary to the first objective of the preamble to the Federal Constitution, and therefore unnonstitutional and void! Note that as a supreme law, the preamble supersedes all laws, regulations, directions and executive actions that give priorities to the Malays and natives of Sabah and Sarawak in all fields and all would be unconstitutional and void. I repeat that the Rukun Negara will be a provision of the Constitution (if the group succeeds), not just an ordinary law like the Harmony Bills (even if they were to become law). If the Rukun Negara were only a provision of the ordinary law, at least we can argue that it contravenes the Constitution and therefore, void. Second, “creating a just society in which the wealth of the nation shall be equitably shared;” This clause provides a more direct support to the first argument. In fact, this clause may be used to challenge Article 153. They may argue that as the preamble was inserted later than Article 153, it overrides the provisions that had existed earlier. Certainly, that must be the intention of Parliament. If not, for what purpose was it inserted? I do not say that there are judges who would accept that argument, but I also cannot say that no judge will accept it. Whatever it is, I dare say that there are lawyers who will put forward such an argument. The question is: If there is no benefit, but only problems, why make it a part of the Constitution? Third, the word “Islam” is not mentioned even once in the Rukun Negara. Regarding the way of life, only “democratic way of life” is mentioned. The first principle only states “Belief in God”. The word “God”, in law, may be “singular” (one) and may be “plural” (more than one). Therefore, the phrase “Belief in God” does not refer to any specific religion. Thus when the Rukun Negara is made a preamble having the force of law, an argument may be fowarded that the intention of Parliament is to treat all religions equally. They can use the same argument mentioned in the second example above. I fear that this late insertion of the preamble will give an opportunity to those who are not happy with the provisions of the Constitution and the laws that exist today to put forward such an argument. If that happens, I believe that it will be more likely that it would be detrimental to the Malays/ Muslims and Islam than to others. 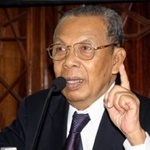 Rukun Negara cannot be equated with Pancasila in Indonesia. In Indonesia, from the very beginning, President Soekarno only popularised the Pancasila to its citizens. Most Indonesians do not even know the Indonesian Constitution or what its role is. On the contrrary, in Malaysia, from the outset we stressed on the Constitution as the supreme law of the country. Rukun Negara was introduced later, even then not as a law. I think it is not correct to say that Pancasila has united the people of Indonesia. The composition of the Indonesian citizens is different from the composition of the Malaysian citizens. The Indonesian citizens are almost entirely comprised of people of the “Malay race” from the Malay Archipelago, who were (unintentionally) united by Dutch colonisatiom for 500 years, the struggle for independence and Soekarno. If there is any role played by Pancasila, it came later and very little. I am not against the Rukun Negara. I only do not agree that it be made the preamble to the Federal Constitution 60 years after the Constitution came into force and giving it the force of law. That is because the reasons for doing so, that is, polarisation, Islamic extremism, hidebound secularism do not exist because of the absence of the preamble to the Federal Constitution. Making it part of the Constitution, will not solve the problem either. Legally too, I do not see any positive effect. Instead, it will open the floodgate to groups that are unhappy with some existing provisions of the Constitution to challenge the provisions of the Constitution, laws, regulations, directives and executive acts considered inequitable, unfair and discriminatory even though all had been agreed to and are enshrined in the Constitution. It will promote vexatious litigation and ultimately cause more racial polarisation. Doing so will cause more harm than good. Actually, by making the Rukun Negara a preamble to the Constitution 60 years after the Constitution came into force is more dangerous than the Harmony Bills. At least, in the case of Harmony Bills, we can argue that they, as ordinary laws, are unConstitutional and therefore void. On the other hand, the preamble, being part of the Constitution shall prevail over the ordinary law and, because it is introduced later, will overide the existing provisions. Let the Constitution remain as Constitution and Rukun Negara remain as Rukun Negara. What is important is that all Malaysians give their allegiance to Malaysia and respect the provisions of the Constitution and each other’s rights that have been agreed to and are enshrined in it. That is all that need to be done. If all Malaysians of various races were to do so, Malaysia will continue to be peaceful and prosperous and the people are free to live their lives according to their own religion and culture well proud to be Malaysians.